I wanted to tell you about a conference that I'm going to be helping with in March. 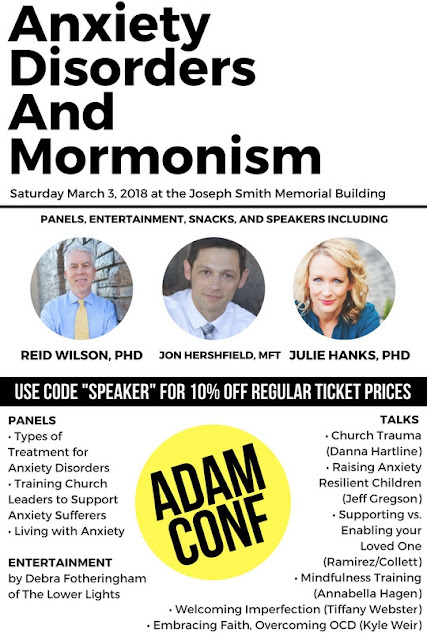 This conference is all about Anxiety Disorders and Mormonism. This is a topic that's near to my heart, we've been dealing with Anxiety for a few years with one of our kids. I'm always kind of amazed just how many people I've talked to have dealt with it as well. I'm excited to learn more ways to combat this in our lives and the lives of those around me. You can check out the details on their website or the flyer below. If you order tickets before December 31st, you get the Early Bird rate, $35 off.